Below you will find all the pricing options for paintball, lasertag, low impact paintball, paintball for younger players and the rate for walk on players. Please note that prices are subject to review and also that only paintballs purchased at Gunsmoke Paintball on the day can be used. Please note only paintballs purchased on the day at Gunsmoke Paintball can be used. No refunds on purchased items. 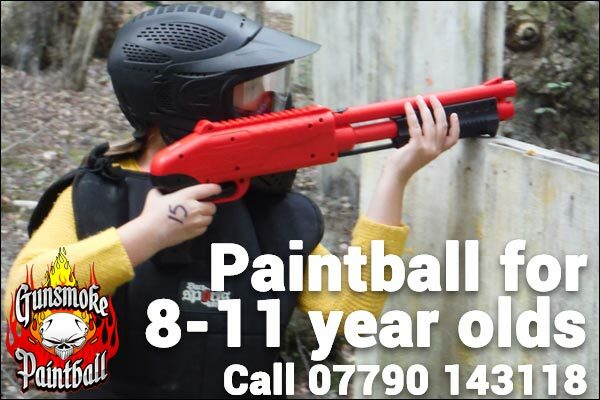 At Gunsmoke Paintball Splatmaster Kids we aim to offer great prices and great value for money to your session. Unlike other paintball sites offering paintball for 8 to 11 year olds, we do not limit you on paintballs if you run out during the game, just ask the marshall and more paintballs are available. Minimum number of players for booking is 10 and parental consent is needed and an adult must be in attendance onsite. Ideal for groups, birthday parties and for special events. Pre-booking is essential and minimum age is 8 years old and anyone under 18 years of age will need parental consent and an adult must be in attendance. We will supply you with everything you need to play although you may wish to bring suitable outdoor footwear. Lasertag is a no impact sport so you can wear your usual clothes if you prefer. Last Sunday of each month is for walk on players and pre-booking is essential. Bring yourself or your friends or team to play. Don’t worry if you don’t have all the equipment you need as we have have everything you need to play just let us know in advance when you do your booking. 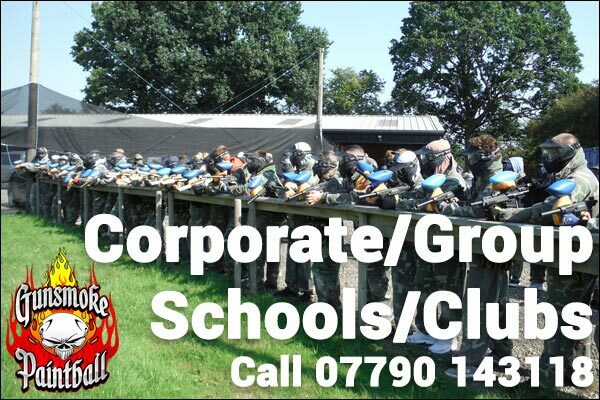 Price is £10 green fee and boxes of 2000 paintballs from £40. We can also hire markers, goggles, and overalls so if you want to play with your walk on player friends you can, please let us know when making a booking if you need this. Gunsmoke Paintball makes an excellent venue for your organisation’s paintballing day out. Paintball is a great team sport and gives the opportunity for employees and managers alike to show their leadership and team working skills. It also encourages participation and confidence and of course some risk taking to achieve objectives in the process. We supply everything you need to play and have a great day at Gunsmoke Paintball. Groups of all kinds can be catered for and we regularly take bookings from schools, youth clubs, stag and hen parties. 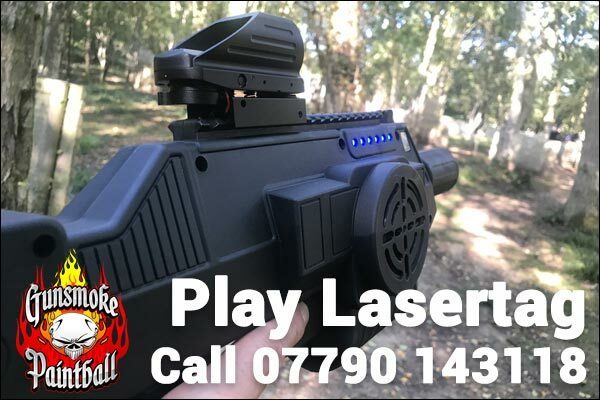 We can cater for large groups and have a large indoor heated safe area, on site paintball shop and also catering facilities on site along with ample vehicle parking space. 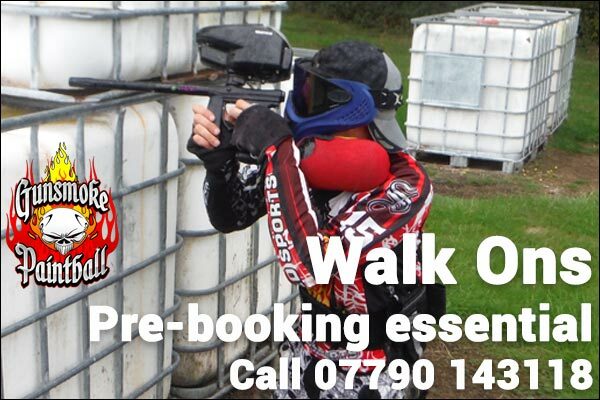 Please call Julie on 07990 143118 or alternatively email Julie@gunsmoke-paintball.co.uk to discuss your group booking requirements.